Website templates, or themes, are these rare phenoms that benefit both first-time site owners and experienced developers — giving them each the opportunity to save time, money, and headaches on website design. It’s true! While my mother loves the idea of being able to point and click to try out color schemes and slider photos, my freelance dev friends love that they don’t have to start from scratch each time a client requests a new site design. Quality WordPress themes are designed to make people’s lives easier, but for some, the trickiest part is getting them installed and operational. Here, we’ll cover the different avenues for installing a theme for your newest web project. Once you’re set up with your host and WordPress installation, you’re ready for the fun part. Go to the official WordPress theme site, or navigate to “Appearance” and then “Themes” in the WordPress backend, and begin your search. You can filter thousands of designs by popularity, date, layout structure, and commercial or featured. Use words like minimal, portfolio, shop, business, artist, grid, etc. Make sure the theme is responsive so it works nicely on all manner of screen sizes. If you need a multilingual site, make sure the theme can support that from the get-go. Choose a theme that is well maintained and not too complex to customize for your goal. Once you’ve found the theme of your dreams, you can choose one of three options for installation: the WordPress directory, ZIP file, or (S)FTP. We’ll walk through each option next. This is, by far, the easiest way to install a WordPress theme. Once you’ve selected your design template, note that you can preview the look and layout on your site. Caution: If you hit SAVE while previewing a theme you will update your site automatically! You can preview and install a WordPress theme directly from the WordPress backend. To install a theme directly from the Theme Directory in the backend, click the Install button on the theme tile. After a successful installation, you can activate the theme for your site! Alternatively, you can manually download and install zipped archives that contain all the files needed to implement a theme (.ZIP files). If you found your theme on a third-party site, this installation option may be required; however, themes on the WordPress site can also be downloaded manually. Evaluate whether you really trust the theme provider (if it’s not the official WordPress site). Check out the reviews of the theme and the specific theme provider. Make sure the file is truly a .ZIP file once it’s downloaded: You can right-click on the file and unzip first, instead of double-clicking (which could execute an unknown executable!). 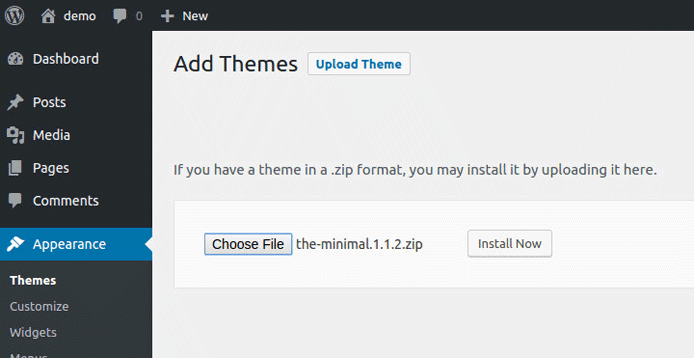 Now, to install the theme .ZIP file, go to the Appearance sidebar menu and click “Themes” in the backend. The newly loaded page should feature an Add New button. Click! Next, you’ll see an Upload Theme button. Click! You’ll then see a Choose File button, which allows you to choose your downloaded .ZIP file before clicking the Install Now button. Voila! From the Appearance menu in the WordPress backend sidebar, you can navigate to add a new theme. Once the installation is complete, you can click “Activate,” and the theme will be live on your site. (S)FTP access is an alternative means of manually uploading your theme. Whether you need to use plain FTP or, the more secure, SFTP depends on your web hosting service. The uploading process itself is the same, though. Note: The (S)FTP upload method might be needed if you only have access to your web server via (S)FTP without direct access to the web server file system itself. You can use FTP or SFTP to upload your WordPress theme — the installation process being identical for both. Download the theme .ZIP file from a theme site. Extract the .ZIP file locally. Use an FTP client (e.g., FileZilla) to access your web server via FTP. Select the extracted file directory in the left pane. Select the target directory, “wp-content/themes,” on your web server in the right pane. Upload files to your web server by right-clicking them and selecting “Upload” on the left. Now your WordPress installation will pick up this new theme. When you now go to the Appearance tab, you will be able to see and activate it. Now You’re Ready to Modify & Launch! Let the customization begin! Whether you’re designing for yourself, a client, or a friend, you’ll find WordPress themes can be an invaluable time-saver. Plus, you get to experiment with some amazingly creative works from other web experts. For the beginners reading, you’ll want to familiarize yourself with the basic tricks to customizing a WordPress site, and the documentation for your specific theme is also worth a look-over. The docs will explain how to customize the template in the most maintainable way. Finally, check out the 50,000-some-odd WordPress plugins for the full breadth of functionality for your site, and maintain regular backups in case the worst should happen. Happy designing!